Pika Energy is the U.S.-based manufacturer of the Pika Energy Island™ home energy management system. This includes powerful smart batteries, islanding inverters and solar optimizers in one. Notably, Pika Energy partners with Panasonic to produce the Harbor™ smart lithium-ion battery. The Harbor™ is designed to provide extended backup power and maximize your on-site solar energy use. But how does Harbor Smart Battery measure up against all the other home energy storage options? Read on to learn more about the Pika Energy Harbor Smart Battery's cost, technology, and warranty coverage. What is the Pika Energy Harbor Smart Battery system? The Harbor Smart Battery system pairs with a solar panel installation to store energy at home, manage your energy costs, and provide backup power. It can be installed as part of a new solar panel system, or added to an existing solar panel system that uses a Pika Islanding Inverter. The Harbor battery is available in two sizes. Their Harbor Flex battery comes with 11.4 kilowatt-hours (kWh) of useable storage capacity. Their larger battery, the Harbor Plus, comes with 17.1 kWh of useable storage capacity. The inverter that is used in the system can manage up to 68 kWh of storage, so you can also install multiple batteries to increase your home storage capacity. The Harbor Smart Battery is a smart choice to pair with a solar panel system, especially if you want backup power for your home or your utility has reduced or no net metering, time-of-use rates, or demand charges. Installing a solar storage solution like the Harbor battery allows you to maintain a sustained clean power supply during the day or night. As with other energy storage products, the Harbor battery is sized for day-to-day use at your home, and is usually installed alongside a home solar panel system. When your solar panels produce more electricity than you can use in your home, the excess is stored in the battery pack instead of being sent back into the electric grid. Later, when your panels aren’t producing enough electricity, you can use the electricity stored in your Pika Energy home battery instead of having to buy it from your utility. Normally, this process happens over the course of a day: when the sun is high in the sky and your solar panels are producing more electricity than you can use, the surplus energy is stored in your Harbor Smart Battery. As the sun goes down and your solar panel production decreases, you draw on the electricity that you stored during the sunniest part of the day. How is the Harbor Smart Battery different from other home batteries? Pika Energy’s flagship product is the Pika Islanding Inverter, which is designed to seamlessly integrate solar photovoltaics (PV) and energy storage. 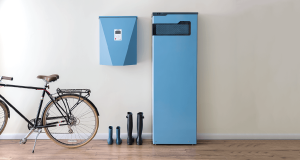 The product was envisioned to create a more flexible inverter solution, and is ideal for both on-site consumption of stored solar energy and grid services like demand response. By pairing Panasonic battery technology with its Islanding Inverter, Pika Energy has created a flexible solar plus storage system that can give most homes enough solar, storage and instantaneous power to cover necessary electricity needs during a power outage, including larger loads like well pumps and HVAC equipment. Pika’s battery solution was designed with two major markets in mind. The first is locations with time-of-use (TOU) electricity rates, such as California, where electricity costs more during the hours of the day when demand is highest. The second is “zero export” markets, such as Hawaii, where solar system owners can’t export their excess solar electricity to the grid. The battery has built-in operating modes that are designed to optimize energy use for each of these scenarios. Can you go "off the grid" with Pika Energy and solar? Installing a solar-plus-storage system at your home is a great way to take control of your electricity bill, but it doesn’t mean that you’re completely disconnected from your utility. Going "off the grid" with solar batteries is actually a more expensive and complicated proposition than you might think. The Harbor Smart Battery is designed to work with both on-grid and off-grid applications, but a single battery won’t be able to power your home for days on end. What warranties come with the Harbor Smart Battery system, and how long does the battery last? The Pika Energy Harbor comes with a 10-year warranty. If the battery packs within the system malfunction during that time, the product is eligible for replacement under Panasonic’s battery warranty. The Pika Islanding Inverter also comes with a 10-year warranty, which is extendable to 20 years. Additionally, if you install a full Pika Energy solar-plus-storage system with PV Link solar optimizers, they are covered by a 25-year warranty. Panasonic’s lithium ion battery technology is similar to other rechargeable batteries both large and small: as time goes on, the battery loses some of its ability to hold a charge. Think of how the battery life of a brand-new smartphone compares to one that is a few years old. As you continually charge and drain your phone’s battery, it starts to lose some of its ability to hold a charge. The life of your Pika Energy Harbor Smart Battery will deteriorate in the same way. That isn’t an indicator of a product flaw – all batteries lose some of their ability to hold a charge over time, whether it’s an electric vehicle battery, a home energy battery, or a rechargeable AA battery. Unlike some home battery manufacturers, Panasonic doesn’t yet offer a warranty for battery capacity over time in the United States. (For example, LG states that its RESU battery will retain at least 60 percent of its storage capacity at the 10-year mark.) That being said, in the future, the Harbor Smart Battery may be covered by an additional capacity or total energy throughput component to their warranty offering. How much does the Pika Energy Harbor smart battery cost? 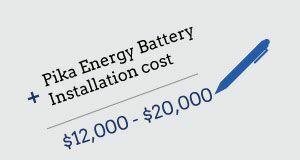 The installed cost for the Pika Energy Harbor smart battery depends on the specifics of your home, as well as your location, taxes, and available incentives, such as the 30 percent federal tax credit. Installed costs typically range from $12,000 to $20,000 before incentives. This is in line with other home batteries of similar size. However, it is important to recognize that every home energy storage system is different. The best way to get a sense of what storage will cost for you is to talk with a qualified installer. Unlike many other options on the market (such as the Tesla Powerwall 2), the Harbor system doesn’t require additional hardware to install. According to Pika Energy, everything is “integrated and designed to return the best performance outcome in terms of usable energy capacity, efficiency and instantaneous power.” It's worth noting that the Harbor requires a Pika inverter. Some functions with the battery may require additional hardware. If you want to install the Harbor battery as part of a solar-plus-storage system, battery costs are just one part of the equation. An average 5 kilowatt (kW) solar energy system costs anywhere from $8,500 to $16,000 depending on where you live and the type of equipment you choose. Solar battery economics depend on a few different factors. Whether or not Pika Energy’s solution makes sense for you is determined by the way that your electric utility structures its rates, the size of your solar system, how much you value backup power, and your reasons for installing a solar battery. While most backup generators are less expensive upfront than a solar battery option, one of the major benefits of using a battery like the Harbor is that they can be recharged with your solar energy. Backup batteries also have lower maintenance requirements than a conventional generator. Learn more about the pros and cons of each option. Other states (such as Massachusetts) are in the early stages of evaluating potential energy storage incentives as well. Most recently, Maryland established a solar battery tax credit worth $5,000 to $7,500. Pika Energy has an installer network that spans all regions of the U.S., as well as Canada and the Caribbean. Whether you want to install a Harbor Smart Battery or other home battery pack, you will need to work through a certified installer. Adding energy storage technology to your home is a complicated process that requires electrical expertise, certifications, and knowledge of the best practices required to install a solar-plus-storage system correctly. A qualified EnergySage-approved company can give you the best recommendation about the Pika Energy home battery and other energy storage options available to homeowners today. If you are interested in receiving competing installation quotes for solar and energy storage options from local installers near you, simply join the EnergySage Solar Marketplace today and indicate what products you’re interested in your profile’s preferences section. Home energy storage is a relatively new product area, and the cost of installing a battery can be high for some homeowners. If you’re thinking about going solar but don’t want to invest in a battery just yet, you can ask your solar installer to design a "storage ready" solar system with an inverter like the Pika Energy Island that is intended to be used with a battery. That way, if you decide to install one down the line, you won’t have to overhaul your system.